Here’s a great example of the ABT in action as well as the ABT/AAA overall structure. It’s Bob Dylan’s 1966 song, “Stuck Inside of Mobile with the Memphis Blues Again”? It’s built of repeating ABT verses with an over-arching AAA structure. Give that man a Nobel Prize (if he wants it). To be stuck inside of Oslo with the Nobel blues again. As he decides whether or not to make a showing at his Nobel Prize ceremony (some of the hosts are already so pissed at him!) let’s take a look at the ABT dynamic at work in one of his greatest songs. The song consists of 9 versus, all with the same basic ABT structure of agreement, contradiction, resolution. The words themselves are not that clearly ABT in structure, but the basic inflection/chord sequence clearly follows the ABT pattern. Each verse begins with a bunch of statements that all have the And, And, And feel. Some of them, like the first verse, even start with “But” but they’re still just statements of exposition. 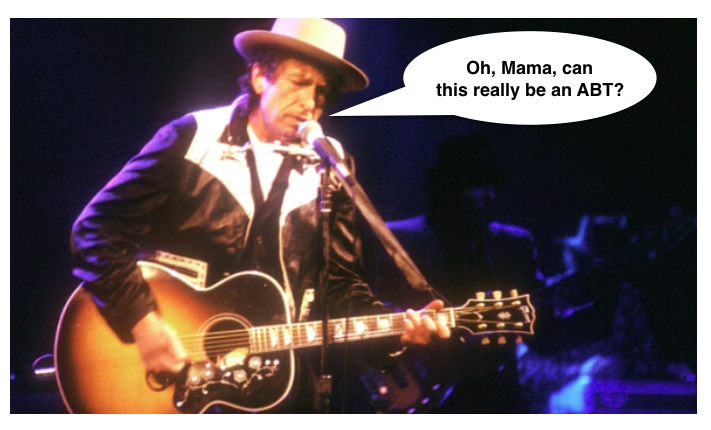 Then the chord goes minor with “Oh, Mama …” and you can feel the contradiction of the flow. In fact, you could drop in the word BUT to make it, “But, oh, Mama …” and it would work just fine. The last line would be a little clunky if you added THEREFORE, making it, “Therefore to be stuck inside of Mobile …” But … you can hear the tone of consequence in the music — i.e. you can feel the tension being released. In fact, you could make it, “So I guess I’m stuck inside of Mobile …” and that would work fine. Same thing, over and over, nine times. 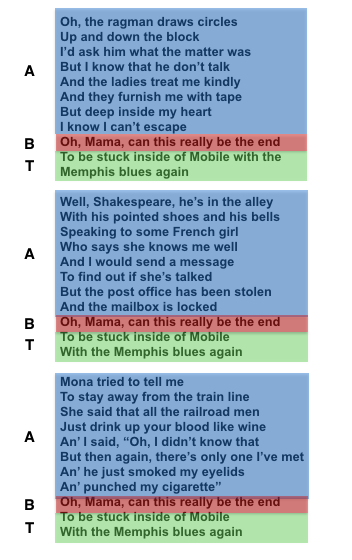 The first three versus of “Stuck Inside of Mobile with the Memphis Blues Again” showing the repeating And, But, Therefore (ABT) structure. Which is cool, and is a perfect showcase for strong character work. But, that said, the character side of the material had better be strong or it’s going to lose us. Lots of nature documentaries are like this — made up of really cool, engaging little vignettes which hold your interest, but in the end leave you without much for a deeper experience. That’s where the over-arching ABT comes into play. It’s what great stories are made of. It’s not obligatory, but it makes the difference between “a sundry list of facts” (as Dobzhansky so eloquently put it) and deep connection. And that, is what narrative is all about. To be stuck inside of AAA structure with the ABT blues again.